Mt. Tsukuba (筑波山) is one of the 100 best mountains of Japan, located in the middle of Ibaraki. 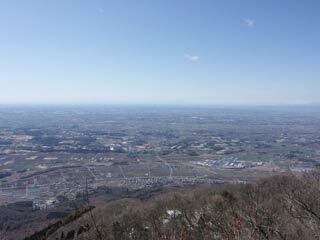 It has a great panorama view of all Kanto region, and when the air is clear, you can see Mt. Fuji. There are two peaks, one is called "Nantaisan" and the other is called "Nyotaisan." There is the shrine on the tops of the mountains, and many people have visited the sacred place for over 2,000 years. Cable car to top of Nantaisan: 1020 for round trip, 510 for kids. Ropeway to top of Nyotaisan: 1070 for round trip, 540 for kids. Mt. Tsukuba has 877m high. There are two peaks, one is Mt.Nantai(871m) and the other is Mt. Nyotai. In the middle of the mountain, there is the shrine called Tsukubasan Shrine, and on the both tops of the mountains, there are shrines, enshrines Izanagi and Izanami. Mt. Tsukuba is one of the 100 best mountains of Japan, the 100 best views of Japan and the 100 best views of Mt. Fuji. Because of the beautiful look, it is prized as "Mt. Fuji for West, and Mt. Tsukuba for East. It is located 2 hours away from Tokyo. Great spots for one day hiking. At the tops of the mountains, you can see great panorama view of all Kanto region.